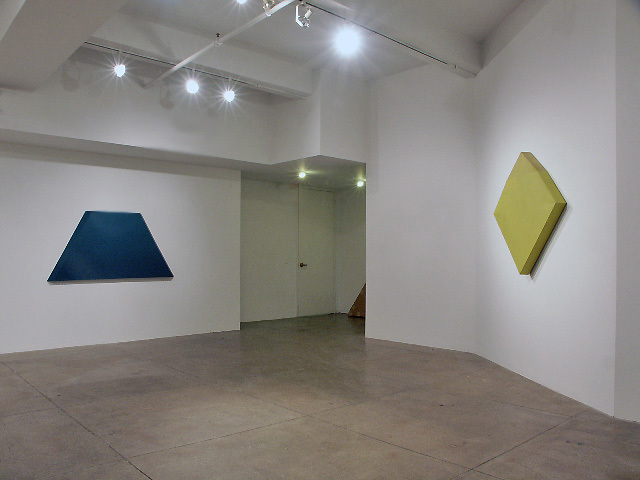 Franklin Parrasch Gallery is pleased to present the first New York show of shaped, monochromatic paintings from 1965-66 by Ronald Davis – including four iconic examples that have not been on public view since the 1960's. In the fall on 1965 Ronald Davis introduced a series of eight geometrically shaped, richly painted monochromatic canvases at the newly opened Nicholas Wilder Gallery in Los Angeles. Consisting of rectilinear forms (e.g. a rhomboid, a parallelogram etc.) this body of work presented an illusionistic spatial order while also projecting an even greater sense of depth than their 4" deep stretchers provided. At play in Davis's applications of two- point perspective were the lessons of spatial fictions learned from methods artists had employed in the past - from early Renaissance painters to Duchamp and, more contemporaneously, to the shaped canvases of Frank Stella. 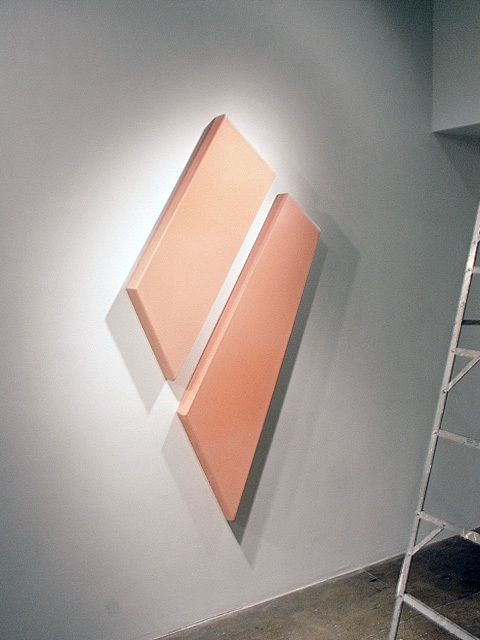 With this new and relatively radical body of work, however, Davis introduced the notion of depicting a three-dimensional abstract shape emanating from the wall as a monochromatic form. The idea of painting as object, hotly considered at that time, took on even greater depth with this work as it seemingly beamed out images of colors and shapes. Davis's concerns with articulating space and perspective amounted to an investigation of form as it encompassed matter. "The nature of form in space..." as curator Susan Larsen has noted "... is the subject of Davis's continuous probe." The work of Ronald Davis resides in over forty museum collections in North America and Europe. It has been the focus of over eighty solo exhibitions including six at Nicholas Wilder, Los Angeles, five at Leo Castelli, New York and five at Blum Helman, New York. Davis was born in Santa Monica, CA and raised in Cheyenne, Wyoming. He studied painting at the San Francisco Art Institute from 1960 – 64, and then moved to Los Angeles where he lived and worked until 1993. Davis currently resides with his wife Barbara in New Mexico. For images, biography, and press information please contact the gallery Tue – Sat, 10am – 6pm.